I’ve talked about this already, but here is more scoop about your college application essay “audience,” and it’s a tough crowd: college admissions officers read zillions of these college application essays and most are BORING, and get tossed in the boring pile!!! If you don’t believe me, here are some quotes from some honest (notice they weren’t quoted by name!) admissions folks gathered by an inspired, veteran English teacher named Jim Burke. As an English teacher, Burke says he often is asked to help students on their essays, and he understands that many of them are either way too long, do not answer the prompt and/or are just like all the other essays. “Another admissions officer I interviewed said: ‘There are three things you don’t ever want to watch being made: one is sausage, one is legislation, and the other is college admissions because the process is sometimes so random, given the number of kids that come across our desks. If you want help bumping up your college application essay or personal statement, read my post on How to Bump Up a Dull Essay. 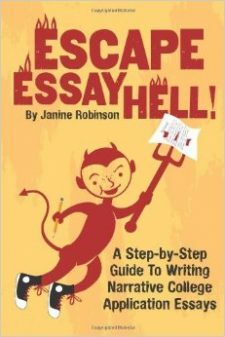 Or, if you are just getting started, use my super helpful Jumpstart Guide.